Dear friends even though I have been crafting and blogging since 2010, I must confess I have never really got the hang of or understood the charm of stamping! So you can imagine how I felt when Rashmi the owner of Itsy Bitsy suggested I try out newly launched Itsy Bitsy clear stamps. I envisioned all my crafty friends cringing and running away seeing my atrocious stamping!! After hours of worrying, researching, and filling up my dustbin with imperfect stamped images I managed to make a stamped swinging Heart shaped box-card.This “all stamped” project is a huge crafty step for me and this write up on Stamping basics is to help other novice stampers!!! They come as mounted [stuck to wooden blocks] and unmounted [easier to store if you have many but extra hassle of having to mount them!]. Transparent -so can see where you stamp! Opaque –so you have to guess where you stamp! Have to mount on acrylic blocks Wood mounted ones are ready to use! Finesse needed to stamp perfectly ! Fantastic for beginners! 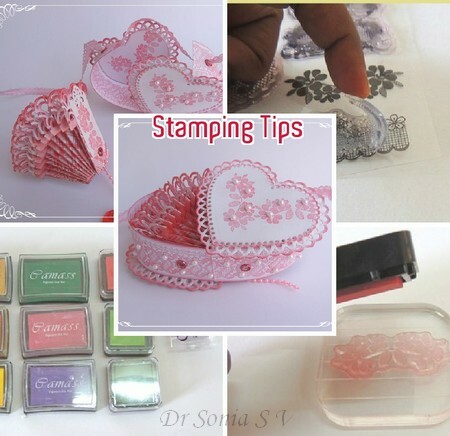 Clear stamps are all the rage nowadays with a huge range of beautiful designs often packaged as sets. For an amateur stamper like me it was a huge challenge to stamp the continuous lace border on the heart box! Since the design showcases the inside too, I used matching stamps on the base and inner walls of the heart shaped box-card. If you find you enjoy stamping ,invest in a set of acrylic blocks as it will be cheaper than buying individual sizes. Some have rounded corners – I love this variety as they feel more comfortable to handle. Special –Fiskars Stamp press –It’s a large acrylic plate with guidelines. Might be useful if you want to mass produce stamped images using more than one stamp as you can position multiple stamps on it, ink and stamp. There is a HUGE variety of ink pads so it can get very confusing!!! For starters the Indian crafter can use the easily available Faber Castel ink pads– they do give vibrant crisp images .The main limitations are there are only limited colors [red,green,black] and the ink pad surface is depressed unlike the raised surface in other inkpads so inking your stamps is not so easy. You can read an exhaustive write up by Ellen on Ink pads. Here is another table I compiled on the best inkpads for a particular purpose based on various online forum reviews. Its always best to experiment what suits your project, tastes and budget the most ! For example even though Versafine is popularly said to be the best ink pad for detail stamping-For the intricate lace design Itsy Bitsy stamp in this project I found I liked the more muted stamped image got with the Itsy Bitsy red pigment inkpad [first image] more than the sharp image I got with Versafine [2nd image in black]! Stamps that are larger than your ink pad can be inked by tapping the inkpad on top of the stamp, while stamps that are smaller than your ink pad can be inked by tapping the mounted stamp on the ink pad itself. Dont rub or press too much,just tap uniformly to cover the whole stamp. Avoid glossy paper,photo-paper,pearlescent paper, handmade paper, textured paper and vellum or acetate till you get the hang of stamping! Dont rock your acrylic block or you’ll get smudged edges- this is the commonest mistake beginners make and you can mess up images stamped even with rubber stamps if you rock your stamps!! Some clear stamps [cheaper varieties] are quite choosy about the type of inks they accept so experiment with different ink pads before your give up! If you are not getting crisp images try placing your paper on a stamping pad/mouse pad or foam pad and then stamp over it…the cushioning effect helps to tremendously improve the quality of the stamped image! If your image bleeds or is not crisp enough try changing the paper you are stamping on. And yes clear stamp quality varies and some cheaper varieties just wont stamp as well ! All my crafty friends seems to be accomplished stampers and I was uncertain about the usefulness of this post but then I will always remember what my blogger friend Jaya told me on this Easy flower tutorial post – that everyday a new crafter is born and nothing is too simple to share!! Thank you so much Jaya! !